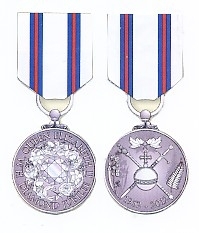 SERVICE COMMEMORATIVES was established in 1992 to provide Servicemen and women with high quality Commemorative Medals for service that various Governments chose not to recognise with official medals. In addition, we stock a comprehensive range of Full-sized and Miniature Medals, Medal Ribbons, Regimental Ties and Blazer Badges, Cap Badges, Display Cases and Many other Military items. We are also keen to purchase any medals that you may have for sale. OR.... You may wish to use our Commission Sales service,please enquire for details and charges. If the item that you require is not listed, please contact us, we may be able to supply it. To Commemorate the Diamond Jubilee of Her Majesty Queen Elizabeth the Second on 6th February 2012, this medal is now available to all who served in uniform as a lasting memento of her sixty glorious years as Monarch.